SurgeonWorkforce serves as a tool to help stakeholders understand one of the most significant public health issues in the developing world – the lack of access to surgical care. 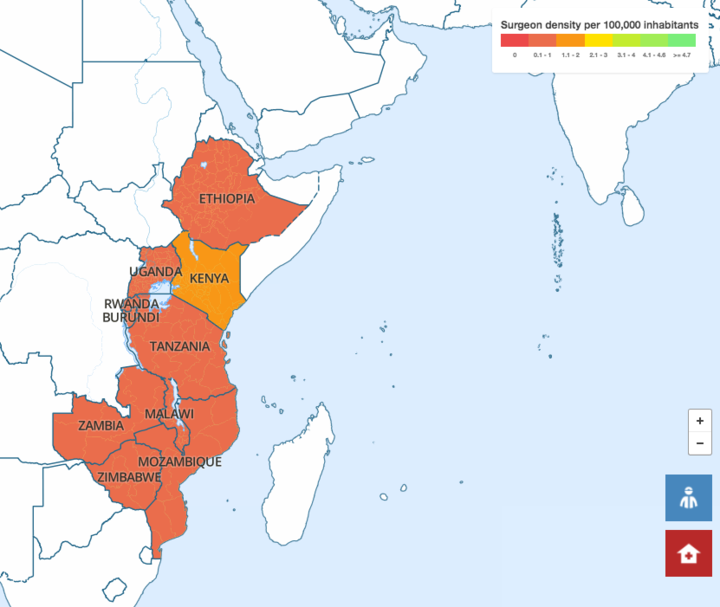 The map was developed by the Royal College of Surgeons in Ireland (RCSI), the College of Surgeons of East, Central, and Southern Africa (COSECSA), and the International Collaboration for Essential Surgery (ICES) with a custom-made real time database that provides comprehensive original data on the surgical workforce in the ten countries of the COSECSA region (Burundi, Ethiopia, Kenya, Malawi, Mozambique, Rwanda, Tanzania, Uganda, Zambia and Zimbabwe). JoMI comment: As a partner at JoMI, I am quite excited to see initiatives of this sort – we share Dr. Henry’s goal and the drive to make surgical intervention accessible around the world in both resource-rich and resource-constrained environments. Our (JoMI) videos have been used for educational purposes in Haiti, and have been made available in over one hundred developing countries through a partnership with the organization Research4Life. We hope to leverage SurgeonWorkforce to influence our editorial and distribution strategy in an effort to maximize the positive impact worldwide on patient outcomes. Thank you for creating it!